Is there any way to view what functions / code are attached to any event for a DOM element? Using Firebug or any other tool. Event handlers attached using traditional element.onclick= handler or HTML <element onclick="handler"> can be retrieved trivially from the element.onclick property from script or in-debugger. Event handlers attached using DOM Level 2 Events addEventListener methods and IE's attachEvent cannot currently be retrieved from script at all. DOM Level 3 once proposed element.eventListenerList to get all listeners, but it is unclear whether this will make it to the final specification. There is no implementation in any browser today. A debugging tool as browser extension could get access to these kinds of listeners, but I'm not aware of any that actually do. Some JS frameworks leave enough of a record of event binding to work out what they've been up to. Visual Event takes this approach to discover listeners registered through a few popular frameworks. The Elements Panel in Google Chrome Developer tools has had this since Chrome releases in mid 2011 and Chrome developer channel releases since 2010. Also, the event listeners shown for the selected node are in the order in which they are fired through the capturing and bubbling phases. 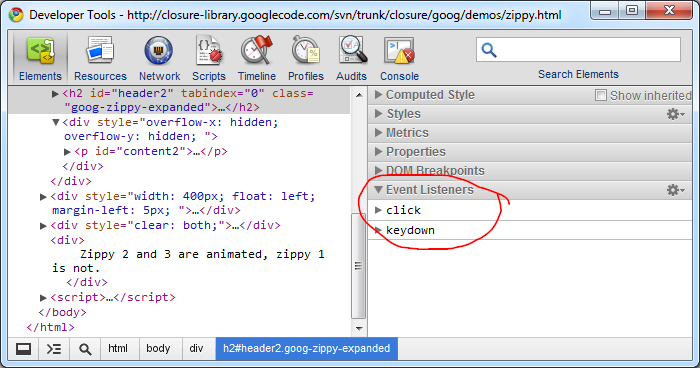 You can view directly attached events (element.onclick = handler) by looking at the DOM. You can view jQuery-attached events in Firefox using FireBug with FireQuery. There doesn't appear to be any way to see addEventListener-added events using FireBug. However, you can see them in Chrome using the Chrome debugger. Listen to events of a certain type using monitorEvents(). Use unmonitorEvents() to stop listening. Get listeners of a DOM element using getEventListeners(). Use the Event Listeners Inspector panel to get information on event listeners. If you know what DOM Node the event listener was attached to you'd pass that instead of window or document. If you know what event you wish to monitor e.g. click on the document body you could use the following: monitorEvents(document.body, 'click');. You should now start seeing all the click events on the document.body being logged in the console. How can I check if an element has an event? Can I find events bound on an element with jQuery?